Let me set the scene on how this might be done. Although aromatic electrophilic substitutions are the grand-daddy of all mechanisms, they present some computational challenges. An electrophile is needed, and this is normally represented by E+. This reacts with an aromatic ring to form (so the text books show) a charged Wheland intermediate. A second stage then takes over, whereby a base (B:) abstracts the ring proton to give BH+ and the substituted product. This is clearly an ionic mechanism. And if one does not forget the counter-ions in all of this (see my post on not forgetting them! 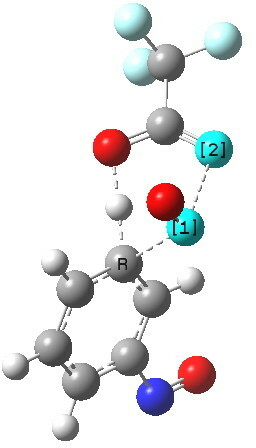 ), it is an ion-pair mechanism. But in relatively non-polar media, need ion-pairs form? A little while ago, I speculated that the two stages could be conflated into one, concerted, pathway. That pathway is shown above. I decided that this was a convenient template upon which to test the directing influence of the NO group. My model is going to be E=NO, R=CF3 (OK, largely because I already had that template to hand; I daresay E=Br might also be appropriate using e.g. acetyl hypobromite) and conducted in dichloromethane as simulated solvent. The transition states (ωB97XD/6-311G(d,p)CPCM=DCM) turn out as below. Transition state for p-electrophilic substitution. Click for 3D. The alternative transition state, leading to m-substitution, is calculated to be 0.7 kcal/mol lower in its free energy activation barrier. So if the nitrosyl group itself appears to be m-directing (a more complete investigation would test this for other electrophiles), why is the product p-substituted? Well, I also showed that nitrosobenzenes can easily dimerise, as shown below. 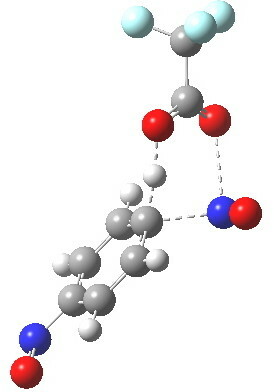 This species now has a π-mesomeric resonance shown with red arrows below which really does promote the attachment of an electrophile in the p-position. This is now perfectly allowed; no issues of σ/π orthogonality here! So the dénouement I suggest is that the experiment on which Robinson based his famous curly arrows can in fact be re-interpreted as indicating that it is the dimer of nitrosobenzene that is involved in its electrophilic substitution, and that the monomer (as with nitrobenzene) is actually m-directing. In effect, that dimerisation (which involves two nitrogen σ-lone pairs), bifurcates one of them into a π-pair, and this pair can now safely resonate with the aromatic ring to direct electrophiles. This entry was posted on Monday, July 23rd, 2012 at 8:51 am and is filed under Curly arrows, Interesting chemistry. You can follow any responses to this entry through the RSS 2.0 feed. You can leave a response, or trackback from your own site. He did bromination (Br2 in CS2), chlorination (Cl2 in CS2) and nitration (N2O5 in CCl4). However, his yield in the bromination was only 40%, and there were many side-products. Nitration with HNO3 would not work, giving only nitrobenzene; thus he used “freshly prepared crystalline nitrogen pentoxide” (never seen that one), and he indicates no yield of the nitroso-nitrobenzene that he isolated. Conclusion: He had his “proof” that the nitroso-group is para-directing, but the data was not perfect – nitrosobenzene simply is not a very good substrate for SEAr. Now fast forward to 1950, where Robertson et al reinvestigate the case. They mention the evidence for the para-directing effect, but also state that this is not really expected, since the N=O group should also be -I, -M (and thus meta-directing, as you find by calculation!). This apparently had already been earlier noted by a certain Mr. Hammick (JCS 1934, 29) who had suggested that nitrosobenzene dimerizes first and then is substituted – just the explanation that you suggest! Well, according to Robertson et al (1950) this may not be true either, but they suggests a mechanism with initial reversible addition of HBr to the N=O bond, followed by a fast bromination of the Ph-N(Br)-OH intermediate. In favor of this, they present kinetic arguments (there is an induction period) and can explain the generation of some side-products; they also argue, that a similar behavior is observed with azobenzene, where no dimerization, but an addition, is possible. I hope you do not find what I am about to write too pretentious. You will indeed have noticed that I posted this entry without having done much in the way of a literature search. There is a certain excitement at not letting other people’s concepts and ideas pollute your own thinking! Somehow, the idea of trying to come up with the “right answer” from quantum mechanics and simple ideas alone, and THEN checking the literature to see if there is evidence is irresistible (but one has to ration ones temptations). So it is enormously appreciated Lukas that you have done my job for me, and added enormously to this thread. Henry, thanks, I absolutely appreciate your approach. Hope you are not bothered by my sometimes lengthy comments – they are just testament to how inspiring the posts are ;-). I think it is wonderful that computational chemistry has reached a level where questions of basic reactivity can be probed, and that the results of theoretical calculations become increasingly predictive (rather than providing “a posteriori justifications”). Have already learned a lot here! To add to the complexity, I have calculated the Wheland transition states for m- and p-nitrosobenzene dimers. The energies are 0.0 (p) and 0.2 (m) kcal/mol. The discrimination in favour of p is slight because steric hindrance from the o-H atoms of the phenyl rings results in rotation of the two aryl groups with respect to each other and the central azoxy group, thus decreasing the mesomeric resonance. So Robertson may well be correct (he does mention that electrophilic bromination proceeds about 10^^10 times faster than for benzene) and that an entirely different mechanism actually operates. I am adding this reference here; DOI: 10.1039/NP9870400061 since it describes the interesting relationship between Robinson and Ingold, and their scientific exchanges from a very good historical perspective.